I love novelty slippers they’re a practical gift idea that is also funny. I love wearing them as well as they keep my feet warm while showing off my fun side. There are some great novelty slippers available, but only a fraction of them ever seem to make it to the local shops which is why I like searching for fun slippers online. The range of novelty slippers that you can buy is really amazing so let’s have a look at some of them. I am the first one to admit that I hate having cold feet, I love wearing fuzzy slippers during the winter and it’s definitely a bonus with working at home as it means I don’t have to take them off!!! I’m also the type of person that wears big fluffy socks to bed as well. When it comes to slippers I do like the novelty ones because they just make me laugh, these are some novelty animal slippers that are also fuzzy slippers which means my feet will stay toasty all day long. I need a new pair of slippers this winter and I'm tossing up between the koala slippers (above), the ladybug ones or the hedgehog ones featured below. There are just so many decisions to make so why not help me by telling me which you prefer in the comments section below. These fun Fuzzy Friends slippers will keep your feet warm on those long winter nights. Cute and comfy, this style is a must this season. Easily cleaned with a damp cloth. The first novelty slippers I can remember coming across were giant animal paw slippers and they continue to be popular both for people to buy for themselves and as gift ideas. I can remember buying a pair for my mother (she has cold feet during winter just like me) and although I was hoping they’d keep her feet warm I also wanted to see the cats reaction! When we emigrated our cat lived out his days with my parents and his reaction to my mother’s giant animal paw slippers was to pounce on them whenever they weren’t on her feet in an attempt to ‘kill’ them – it was a lot of fun to watch…….until he noticed we were watching and then in a very catlike move he would feign washing himself and ignoring us! There are lots more novelty slippers which you can purchase, just see the opposite column for some more ideas. I think there are endless different types of animal or monster slippers that can really delight kids of all ages. The majority of novelty slippers for adults do seem to be marketed at women however which I used to think was strange, but now I think it's just that women seem to have colder feet in general than men - what do you think? Opposite I have compiled a short selection of novelty slippers that I think men and women could both be comfortable wearing starting with the classic Mario Brothers - these are really cool, retro slippers and I know a number of people who would kill to get a pair of them. 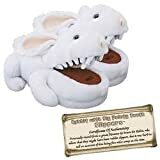 Next we have Killer Rabbit slippers and if you're a fan of Monty Python you'll recognize these instantly - I think I've finally found a pair that my hubby will really appreciate! Last, but not least we have some novelty slippers for the sports fans. 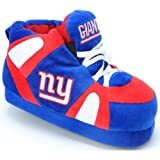 Forget about the 'boring' slip on slippers bearing your favorite team's logo, these novelty slippers are so much better as they are styled like sneakers! Grab one from your favorite NFL team (or get one for a friend) and look good while you keep your feet warm this winter! Do You Wear Slippers in the Winter? Yes, absolutely I hate cold feet! No, I'm tough I can handle the cold! The most important reason to wear slippers of any kind is to keep your feet warm, but why novelty slippers? Novelty slippers can add a little bit of fun to your indoor outfit and anything to make you smile on a winter's day when it's cold has to be good. If you have a child in the house who's feeling a little sad or sick then you can make your feet talk and bring a smile to their face. My father is really good at moving his feet in time to the voices he makes when he has some novelty slippers on which is probably why he's always been a favorite uncle to all of my cousins. So instead of wondering why you should wear novelty slippers perhaps you should be wondering why you aren't wearing a pair of gorgeous slippers with animals or big paws or the Mario Brothers on them. Go on try a pair - you know you want to deep down - unleash your inner child and let the novelty slippers come out to play! I'm more of a practical girl. I wear suede and sheepskin slippers. Boring but oh, so warm. I am constantly cold ALL.WINTER.LONG. Slippers are a MUST for me.